In the fascinating world of luxury yachts, many of the world's finest superyachts are discovering South East Asia and the incredible cruising waters of Thailand. Streaming into Koh Samui, Thailand superyachts are experiencing some of the most stunning maritime scenery in the world and meeting and/or catching up with the personable Captain Charles (‘Champagne Charlie') Dwyer, a co-founder of Asia Pacific Superyachts, managing director of APS Samui & APS Langkawi and founder of Samui Yacht Services. A tropical gem rising off the south-eastern seaboard of Thailand, Koh Samui is the Kingdom's second largest island after Phuket. Relatively unknown for years this sun lovers' paradise of azure waters and uninhabited islands has attained international standards of service and awards with Captain Charlie providing a unique itinerary of this special area to visiting superyachts. 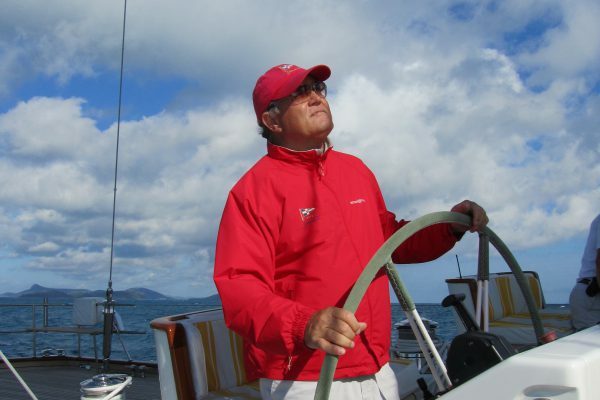 Captain Charlie is the holder of a 1600 Tonne USCG 3000 Ton International license and a lifelong ardent American sailor and has captained some of the most prestigious yachts in the world in the last 25 years. "Though there is no marina there are many anchorages in Samui, Koh Phangan, Koh Tao and surrounding areas. Koh Samui is the hub of the Gulf and is the best and easiest port of entry in the Gulf of Siam. Returning to the island, I'm reminded each time of the breath-taking natural beauty of Samui and its stunning cruising waters. Beginning a sea journey here". Q: Please tell us about superyachts in Thailand's Gulf waters & Langkawi! A: The Gulf of Thailand is becoming the newly discovered playground for Superyachts. Superyachts travel from Langkawi at the end of the monsoon season and come to visit Koh Samui and the Gulf of Siam before travelling onwards to Cambodia, Vietnam and Borneo. Koh Samui is the East Coast Hub of Thailand. Simply beautiful. Q: How did you get into this line of business? A: Long Story but the short version is I have been the captain of superyachts for the past 25 years and I worked with many different agents. It was a natural progression from captain to agent. I have now been an Agent for Asia Pacific Superyachts for the past 10 years. With this experience, I know what has to be done and I know how to get it done. I have sailed the waters of Thailand and the Gulf so many years that I more experience in this region than any captain I know. Q: What is your experience being out at sea on a superyacht in a nutshell? A: 90% of the time it is like being in heaven the other 10% is Hell!!! A: Tough to say but the challenge of fulfilling the client's requests even when they do not think it is possible. I love the interaction with the captains, crews and the guests. Yachties are a special breed of people and I enjoy their company. Q: What boats (or owners/ captains) have you worked with that stand out in your mind? A: I have had the pleasure of dealing with many captains and owners over the years but Barry DeKock, Mike Dailey and Don Anderson are just a few of captains that have stood out as being very professional and a pleasure to work with. Q: What attracts superyachts to Koh Samui & the Gulf? What is the average stay? A: Natural beauty and the wonderful Thai people are the real attraction, after that it is the food and spas. I have sailed around the world 8 times so far and in my opinion, Thailand has the most to offer. The average Superyacht stays in the Gulf 10 days at a time. Many yachts will venture further afield such as Cambodia or Vietnam and then return to Samui and the Gulf for additional time before their final departure from Thailand. Q: Asia Pacific Superyachts network is spread out widely across Asia Pacific. How does this benefit superyachts voyaging to the Pacific & South East Asia? A: Superyachts using our network have a distinct advantage in the fact that APS works as a cohesive group. Once you are using APS agents you are in a family of like-minded individuals with a set structure of invoicing and dealing with clients. Q: What do you see in the future for Super yachting in Asia? A: The future is for more marinas, more infrastructure and for more Superyachts. Asia and the Pacific are becoming very popular destinations. I believe this area is now on every owner's bucket list.